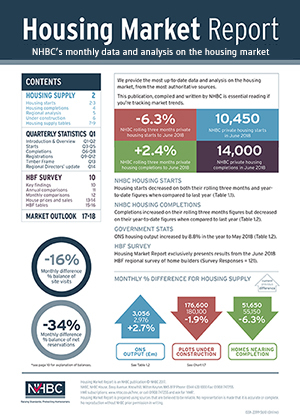 If you need the most up-to-date commentary and analysis on housing market data, from the most authoritative sources, the Housing Market Report (HMR) is for you. Existing subscribers tell us they rely on the report for data that they just can’t get anywhere else. They use it for their own reports or to track market trends and inform strategic decisions. The annual subscription consists of 11 online issues (there is no December edition). 4 are quarterly issues with additional in-depth data such as in your free July 2018 issue; 2 of the quarterly issues also include a round-up of views on the state of the market from our expert panel. Subscribers receive access to all back issues of the Housing Market Report to August 2016 – great if you need to look at trends over a period of time – and are able to download and share every issue from our online archive during your subscription period.